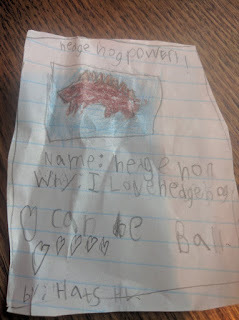 Pokemon cards aren't allowed at my school, so I made hedgehog cards. I love your hedgehog pokemon card! This blog is really helping me appreciate hedgehogs more. Thank you Harriet! This is great, Harriet. I'll be following your blog to find out more. Incidentally I love your Mrs. Twiggy Winkle statue!